Throughout the Advent season, we have been following Christ’s command, which we heard on the first Sunday of Advent, “Watch therefore; you do not know when the lord of the house is coming . . .” (Mark 13:35). It is sometimes difficult to remember why we’re keeping watch. 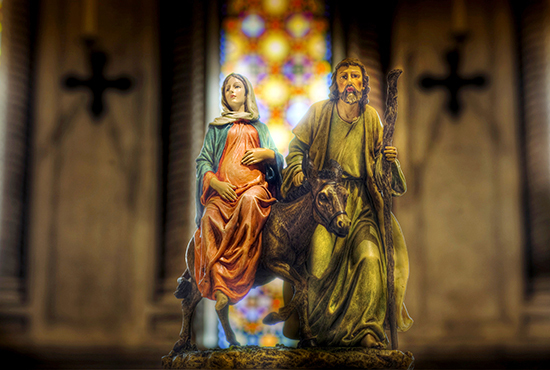 In the midst of our often busy season of Advent, the Church reminds us why we keep vigil. Each year we celebrate Gaudete Sunday. Gaudete means “to rejoice.” In this season of waiting we’re reminded to rejoice. In the second reading, we are given the simple command by Christ through his servant St. Paul, “Rejoice always.” These words are part of St. Paul’s final advice to the Thessalonian church in his first letter. He leaves them with a simple theme, which forms the context for the third Sunday of Advent. Although we’re making the watchful approach to adore the Christ child in the manger at Christmas, we are reminded again that what we’re waiting for has already come. So why have a season of waiting? If we are rejoicing now, why have Advent at all? The prophet Isaiah was speaking to the nation of Israel. The Israelites were looking forward to the coming of a great warrior, an anointed one, a messiah who would save them. The prophet is identifying one of the deepest desires of the human heart: the need for healing and salvation. And Christ has already won this victory, but calls us deeper. John the Baptist lived the mystery of Advent in a way; he already possessed Jesus in his call to repentance and conversion of heart, while at the same time preparing for Christ’s coming. This is the contemplative look of the Advent season, waiting for our Savior while at the same time rejoicing today because he has already come. It is in light of these glad tidings that we rejoice! How can we live out this spirit of rejoicing? It seems most fitting to have a spirit of gratitude. Even when the tensions of this season in our culture can tempt us to gripe, have a short temper or be dissatisfied, we must live in gratitude for the gift of Christ already coming among us. Deacon Laski is in formation for the priesthood at the St. Paul Seminary for the Diocese of Superior, Wis. His teaching parish is St. Anne in Somerset, Wis. His home parish is Holy Trinity in Haugen, Wis.